Do you remember the listening pointing out the differences between Americans and the British? The American guy was complaining that British people tend to play down their achievements. This story is a perfect example. Imagine you have been married for many years and find a scrapbook in the attic containing the names, pictures and documents of children that your partner saved. In 1939, a young stockbroker named Sir Nicholas Winton in London dropped everything to do something amazing: he risked his life to successfully save 669 mostly Jewish children from Czechoslovakia during The Holocaust by ensuring their safe passage to Britain. 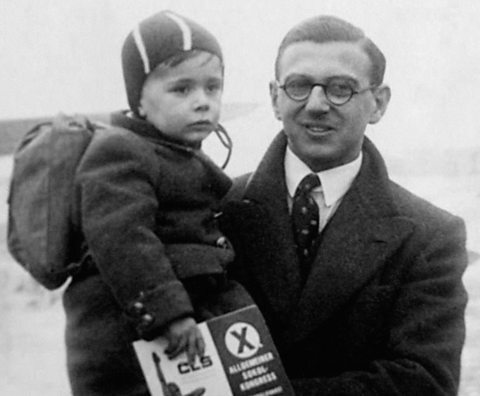 Nicholas Winton photographed with one of the children he rescued in 1939. In the early years of Hitler’s rule, the Nazis attempted to make life so unpleasant for Jews that they would be forced to emigrate. Yet few other countries were willing to accept an influx of Jewish refugees. Many countries, including Britain, tightened their immigration policies. In the summer of 1938, 32 countries met in Évian, France, to address the growing refugee crisis. But virtually all refused to allow more Jews in. Does the story ring a bell? Just change the word ‘Jews’ / ‘ Jewish’ for ‘Syrian’…. How did he do it? Listen to the whole story (just 15 minutes and a really good listening). But he didn’t stop there; he kept helping the needy. Doing what?